When the city of Rose Creek finds itself under the iron heel of tycoon Bartholomew Bogue, the desperate citizens led by Emma Cullen seek the protection of seven outlaws, including bounty hunters, gamblers and killers: the battle will not be long in coming. 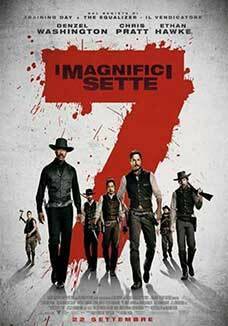 Remake of the 1960 western [of the same name] directed by John Sturges, The Magnificent Seven is a blockbuster which succeeds in entertaining and thrilling the audience. Among frenzied battles, explosions, horse races and duels, the film is not a mere melancholy reinterpretation of a declining genre to be viewed in a contemporary way but it redraws the breath of a bygone era, effectively adapting to today's technology and tastes. Antoine Fuqua (who directed Training Day and Southpaw) has gathered an impressive cast, led by Denzel Washington, Ethan Hawke and Chris Pratt: the latter is one of Hollywood’s new stars after being protagonist of Guardians of the Galaxy and Jurassic World. TRIVIA: The original The Magnificent Seven from 1960 was itself a remake of a masterpiece of Japanese cinema. Which one? When the city of Rose Creek finds itself under the iron heel of tycoon Bartholomew Bogue, the desperate citizens led by Emma Cullen seek the protection of seven outlaws, including bounty hunters, gamblers and killers: the battle will not be long in coming. Remake of the 1960 western [of the same name] directed by John Sturges, The Magnificent Seven is a blockbuster which succeeds in entertaining and thrilling the audience. Among frenzied battles, explosions, horse races and duels, the film is not a mere melancholy reinterpretation of a declining genre to be viewed in a contemporary way but it redraws the breath of a bygone era, effectively adapting to today's technology and tastes. Antoine Fuqua (who directed Training Day and Southpaw) has gathered an impressive cast, led by Denzel Washington, Ethan Hawke and Chris Pratt: the latter is one of Hollywood?s new stars after being protagonist of Guardians of the Galaxy and Jurassic World. TRIVIA: The original The Magnificent Seven from 1960 was itself a remake of a masterpiece of Japanese cinema. Which one?